Floor pricing has been the stumbling block for credibility with automated valuation models (appraisal replacement tools) used by banks and for services like Zillow. StreetEasy gets it right, in the way they display information – grouped by building so the patterns are apparent. Matthew Strozier over at The Real Deal Magazine asked me to crunch apartment prices to show some sort of floor level relationship to value. I took the down and dirty approach (because SPSS is way over my head) and looked at all closed co-op and condo sales in 2009. 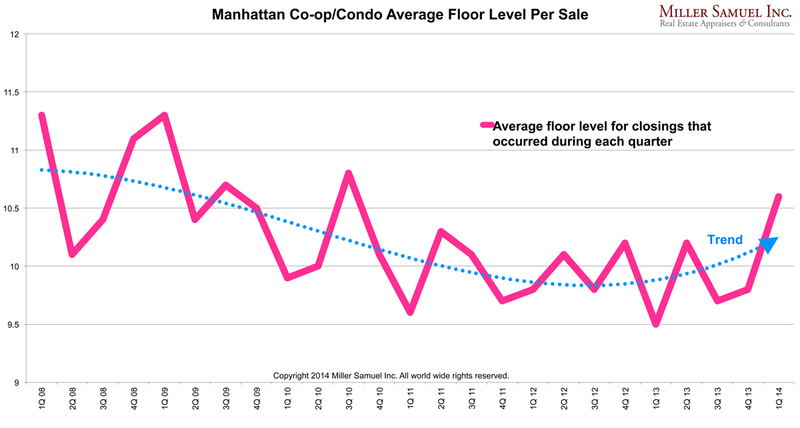 I broke those sales down by floor level and crunched the metrics for each floor. The results are seen in this very cool chart. Click on the graphic to the right that TRD created to open the big version. 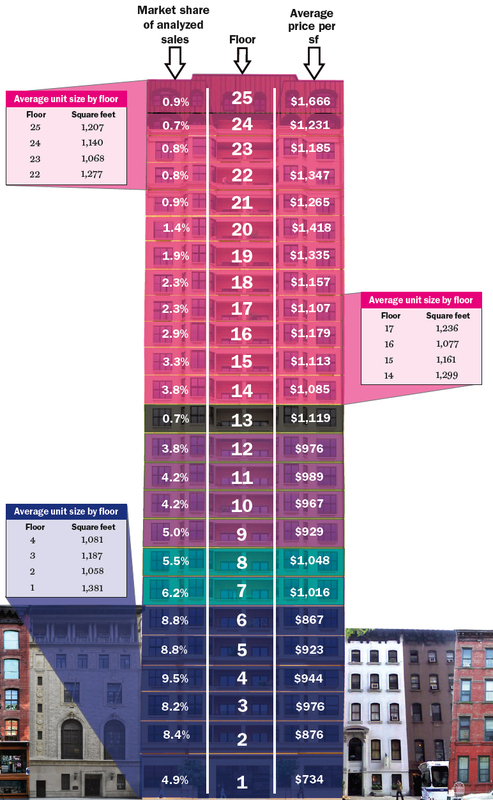 Third Column – Average Price per Square Foot of all sales in 2009 on that specific floor. 1st floor – 19.3% jump to second floor reflecting concerns about security, privacy and noise levels. 2nd floor – 11.4% jump to third floor reflecting concerns about security (scaffolding), privacy and noise levels. 7th floor – jump reflects penthouse and roof line breaks from adjacent 6 story buildings. 13th floor – data suggests only 18.4% of buildings with a 13th floor actually call it that. above 13th floor – market share declines with height, reflecting fewer apartments and the floor level price per square foot continues to rise. In addition, the erratic price per square foot patterns on the higher floors reflect the differences in views. In our appraisals were make adjustments for floor level and view separately. I ended the presentation at the 25th floor only because the data set gets so thin that it was more difficult to extract or infer a pattern.